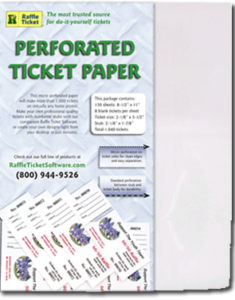 Our perforated raffle ticket paper is sold in convenient 130-sheet packages which is enough for 1,040 finished tickets. Each sheet is the standard 8-1/2 x 11 size and contains 8 tickets. Bond paper has a weight of 24 lbs. which is similar to typical copier (20 lb.) paper. Bond is flexible, and works on any printer. Card paper has a weight of 67 lbs., similar to the weight of index cards. Card is durable, holds up to wear and tear. It works best in printers with a straight paper path.